7521 HistoryLink.org articles now available. Diablo Dam incline railway climbing Sourdough Mountain, 1930. Courtesy Seattle Municipal Archives, 2306. Children waving to ferry, 1950. Courtesy Museum of History and Industry. Loggers in the Northwest woods. Courtesy Washington State Digital Archives. We are very saddened by the death of our close friend Bob Royer, who served on the board of HistoryLink for more than 10 years and was board chair for a number of those years. Not only was Bob passionate about history, he was also an integral part of Northwest history as one of Seattle’s foremost civic leaders. Born in Oregon in 1943, Bob moved to Seattle in 1968 and began producing documentaries for KING-TV, where he was later joined by his brother Charles Royer. 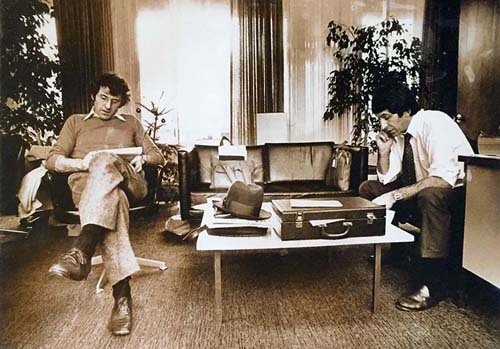 In 1976, Charley asked Bob to join his successful mayoral campaign, and Bob ended up serving more than five years as deputy mayor. During his tenure, Bob was instrumental in negotiating the Skagit River Treaty with British Columbia, which he considered his proudest achievement. Bob served as chair of the Washington State Centennial Commission in 1988 and 1989, and later became public affairs and communications director for Seattle City Light. In 2008 he joined Gallatin Public Affairs, and for the next 10 years provided leadership and guidance in areas such as energy, media, public utilities, crisis communications, and local government affairs. He also wrote for the online news site, Crosscut. But as busy as he was, Bob still made time to help in our endeavors here at HistoryLink. We owe him a deep debt of gratitude for his role in our success, and we will truly miss the pleasure of his presence. One hundred and thirty years ago this week, on April 18, 1889, a devastating fire wiped out much of Cheney in Spokane County. This was just the first of several notable conflagrations throughout the state that year, and was followed by major fires in Republic, Seattle, Ellensburg, and Spokane. The towns all rebuilt in brick, but Cheney suffered yet again when the main administration building of the State Normal School -- now Eastern Washington University -- burned down on April 24, 1912. As we saw this week in Paris, famous and beloved landmarks can be wiped out by fire in almost an instant. And although Washington does not have major buildings that date back centuries, it has seen more than a few noteworthy blazes over the years. In 1898 Tacoma's Western Washington Industrial Exposition building -- then the largest frame building on the West Coast -- burned down. In 1902 St. Anne's Roman Catholic Church, established at Tulalip in 1857, burned beyond repair. And in 1903 the people of Winslow (now Bainbridge Island) watched their first community-built steamship, Eagle, burn to the waterline while moored at the dock. Seattle's Grand Opera House burned in 1906, and in 1909 fire destroyed the Snohomish County courthouse. Seattle lost the Grand Trunk Pacific dock in 1914, the Grand Theatre in 1917, and the Lincoln Hotel in 1920. Centralia lost its Grand Theatre in 1924, and a year later the Great Northern Railway's grain and ore terminal in Seattle burned to the ground. And in 1928, fire destroyed the third floor of the Old State Capitol Building in Olympia, along with its clock tower. In 1949 the Big Four Inn, a well-known resort in Snohomish County, was consumed by fire. In 1955 flames destroyed Marysville's largest industry, the Weiser Lumber Company. The Seattle Cedar Manufacturing plant in Seattle went up in smoke in 1958, as did the abandoned Wheeler-Osgood Company mill in Tacoma a year later. Bellevue's beloved Lake Hills Roller Rink suffered a huge fire in 1968, and a year later an arson fire destroyed the Pacific Trail Sportswear factory in Seattle. Tacoma's landmark Top of the Ocean restaurant was destroyed by arson in 1977, and the Lowell Community Church, Everett's oldest church building, burned in 1984. Seattle lost the Jolly Roger restaurant -- once a gambling den, speakeasy, and bordello -- to arson in 1989, and in 2001 Masin's Furniture Store and other businesses were wiped out in Old Bellevue. Over the years, advances in fire protection have helped save many other structures, but history has shown that our built environment is always at risk. On April 22, 1970, the first Earth Day celebration was held to raise awareness of environmental issues. On that day, Washington Senator Henry M. Jackson -- a leader on environmental legislation -- spoke at UW and WSU on the dangers of environmental degradation. In Pullman, some students pelted him with marshmallows due to his hawkish stance on the Vietnam War, but Jackson caught a few and threw them back, eliciting cheers. In keeping with Earth Day celebrations, we also note that this week marks events in two early studies of the Northwest's natural world that took place two centuries ago. On April 22, 1812, fur trader, map maker, and geographer David Thompson left Kettle Falls for Montreal, having spent the previous year undertaking a scientific survey of the Columbia River. His explorations led to the first accurate rendition of the Inland Northwest north of the Snake River. And on April 20, 1825, Scottish naturalist David Douglas arrived at the Hudson's Bay Company's Fort Vancouver, one month after the fur-trading outpost opened on the north bank of the Columbia River in present-day Clark County. Douglas, a collector for England's Horticultural Society, was dispatched to the Northwest coast to bring back specimens and seeds of regional plants for introduction into British gardens and forests. In September that year, he made the first recorded ascent of the Cascade Mountains. On April 22, 1854, the Washington Territorial Legislature incorporated the city of Steilacoom. Despite its promising start, railroad construction in the 1870s bypassed the town, and its growth slowed as Tacoma became the Pierce County seat and main industrial and economic center. On April 24, 1877, General Oliver O. Howard met in a day-long council with Smohalla, an influential Wanapum spiritual leader. Howard told Smohalla that he and his followers must move onto the Yakama Reservation. However, distracted by the Nez Perce War that broke out a few weeks later, Howard took no steps to enforce the order, and Smohalla ignored it. On April 22, 1889, Duncan Hunter filed a homestead claim to 80 acres of dense forest in south Snohomish County, becoming the first non-Indian resident of what would become Lynnwood. Other homesteaders soon followed, but the city didn't incorporate until April 20, 1959. On April 18, 1911, a group of Seattle civic leaders incorporated a local branch of the Boy Scouts of America, which had been founded on the East Coast just the year before. The Chief Seattle Council received its charter five years later and was the first of the seven BSA councils that now serve Washington. One of Washington's longest and nastiest strikes began on April 22, 1948, when aeromechanics walked out of Boeing. Group Health Cooperative expressed solidarity with the machinists, but the strike took a peculiar twist when Boeing allied with Teamsters leader Dave Beck to lure workers into an alternative union local. The IAM beat back Beck's effort, but its members returned to work after six months with no new contract. Century 21 -- America’s Space Age World’s Fair -- opened in Seattle on April 21, 1962. For the rest of that summer visitors got an optimistic glimpse of things to come, even though the fair got off to a rocky start and almost ended with a bang. Seattle's first automatic traffic light begins operation on April 21, 1924. Japanese Americans are ordered to evacuate Seattle on April 21, 1942. Northgate Shopping Mall in Seattle opens on April 21, 1950. Century 21 World's Fair opens in Seattle on April 21, 1962. Plane crashes during Century 21 opening day festivities on April 21, 1962. Belgian waffles are introduced in America at the Seattle World's Fair on April 21, 1962. Tacoma Dome opens its doors on April 21, 1983. Next 50 celebration starts its six-month run with opening day ceremonies at Seattle Center on April 21, 2012. Report of two Washington State Patrol troopers on their undercover surveillance of the Satsop River Fair and Tin Cup Races rock festival is submitted on September 20, 1971. 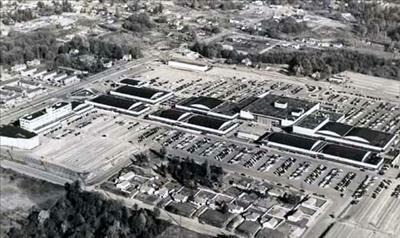 Northgate Mall, one of the nation's first modern shopping centers, opened in Seattle on April 21, 1950. Help us tell more of Washington’s stories.